Lately, I've been overwhelmed by color. Everywhere I look, life is in bloom again. The trees are budding with tiny pastel bursts. The early evening sky has been an ombre display of muted ambers, grays and blues. Once more, the aisles at our local market are verdant and brimming with piles of spring's early produce. The whole world seems to be coming back to life in a way. At the start of this season of renewed life, the chef and I have been desperate to enjoy our life together as much as possible this month. While the days grow longer and the air grows warmer, we are constantly reminded that we are moving closer to the start of our busiest season yet. In fact, as I sit at my desk typing this sentence, we are exactly three weeks away from opening day at our first summer pop-up. And while the markets have not officially started up just yet, long days and nights back at the shop have slowly begun to seep their way back into our lives. And so we've been making a conscious effort to live as fully as possible before our lives once again become a blur, and the bulk of our conversations shifts back to talk of employee schedules and menu concerns. We’ve been spending a lot of time with family. We’ve been visiting friends with a sense of relentless determination. We’ve been engaging in some mindless day drinking. But mostly, we’ve been spending a great deal of time in the center of our lives – our home – to cook and to converse and to enjoy as many quiet moments together as time will allow. 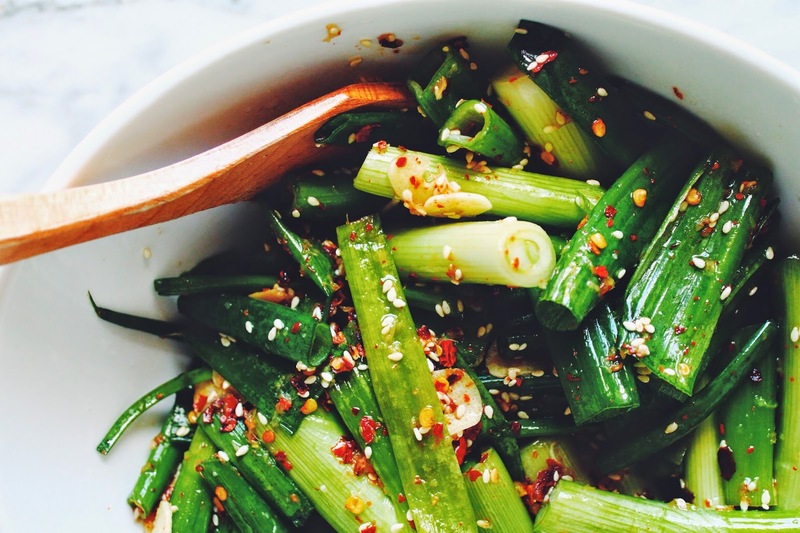 Full disclosure: I’m in love with the idea of this Scallion Kimchi. 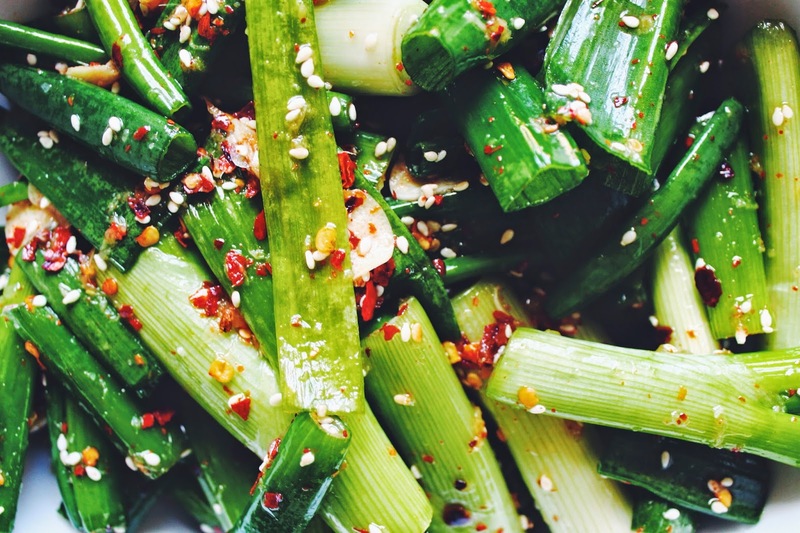 This time of year, when the aisles of our local market turn green once more, I have a habit of purchasing at least a half dozen bunches of scallions every week (they’re marked 6 for $2…how can I resist?). I love the bite of fresh scallions sprinkled across poached eggs or a bowl filled with an otherwise bland grain. 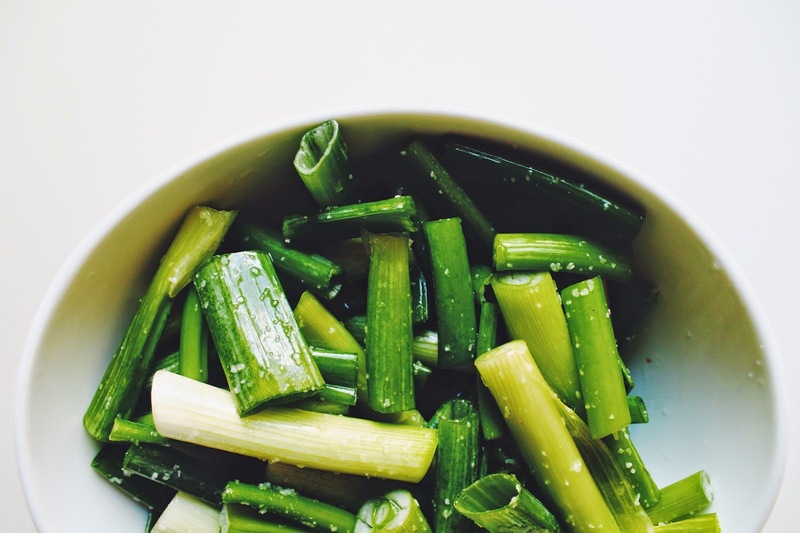 I love to slow roast multiple bunches of scallions to release their hidden sweetness, and then twirl them on a fork and eat them whole. But mostly, I love having them on hand to add something a little fresh to all our meals, making each plate look a little bit more like spring and a little bit more alive. Wash and trim the scallions and cut into thirds. 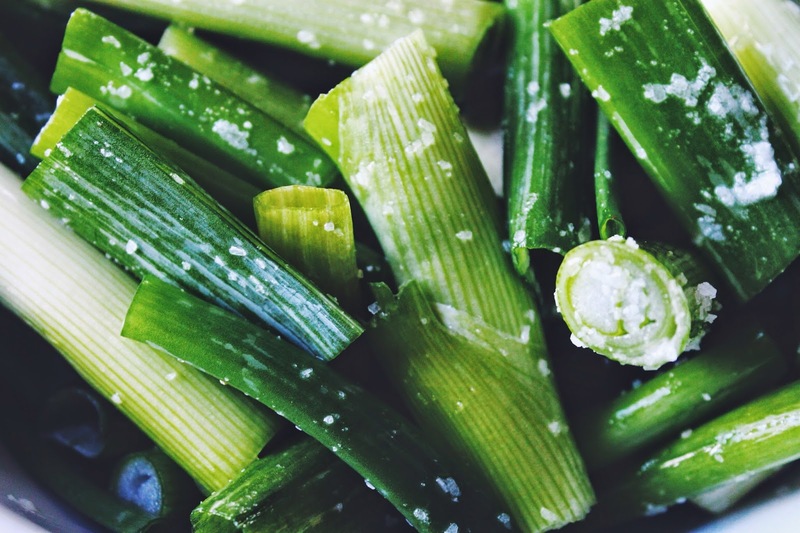 Add the sliced scallions to a large bowl and sprinkle with the salt. 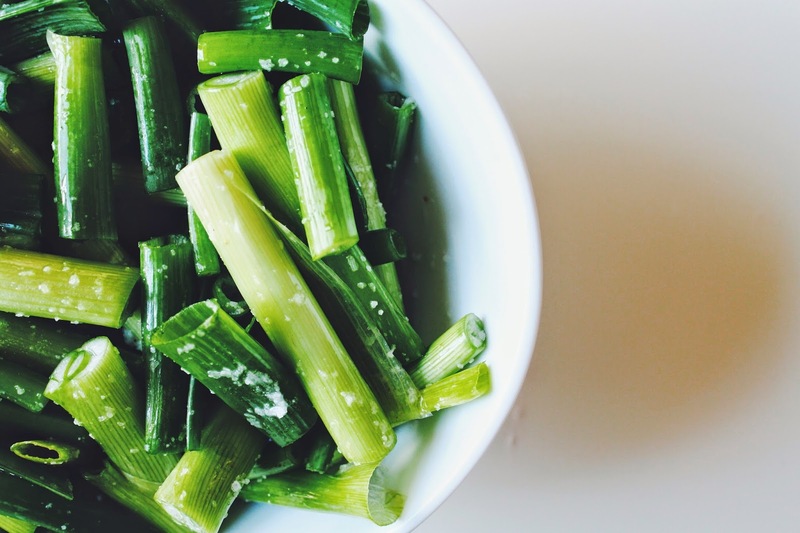 Give the scallions a gentle mix and allow to stand for 10 minutes. In a separate bowl, mix together the garlic, the sugar, the ginger, the red pepper flakes, the sesame oil, the sesame seeds, the fish sauce, and the vinegar. Pour the mixture over the scallions and toss well to coat. At this point, you have two options. If you'd like, you can eat the mixture right away. Think of this more like a "quick pickle" as opposed to a true kimchi (though the taste is still very good!). 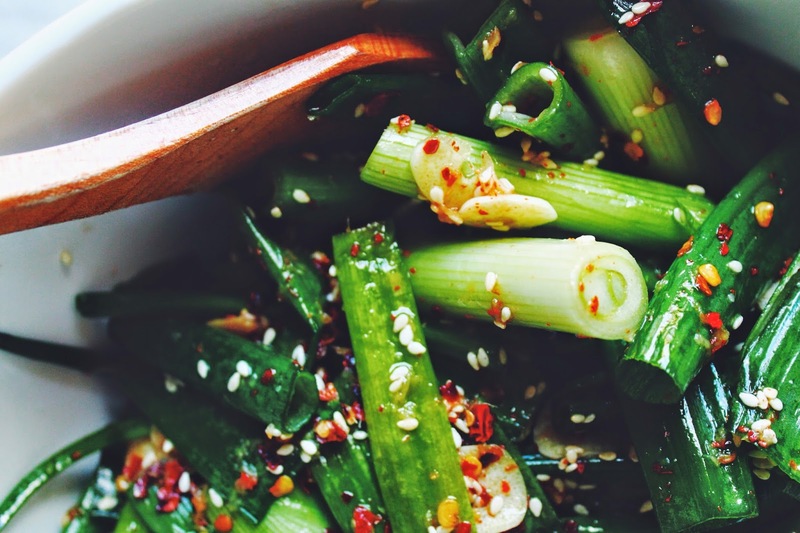 If you'd like to ferment, lay a plate over the bowl of scallions and leave it covered in a warm, but not hot, place (about 70 degrees) for 24 hours. Regardless of which method you prefer, the mixture will keep well for 3-4 weeks when stored in an airtight jar and kept refrigerated. 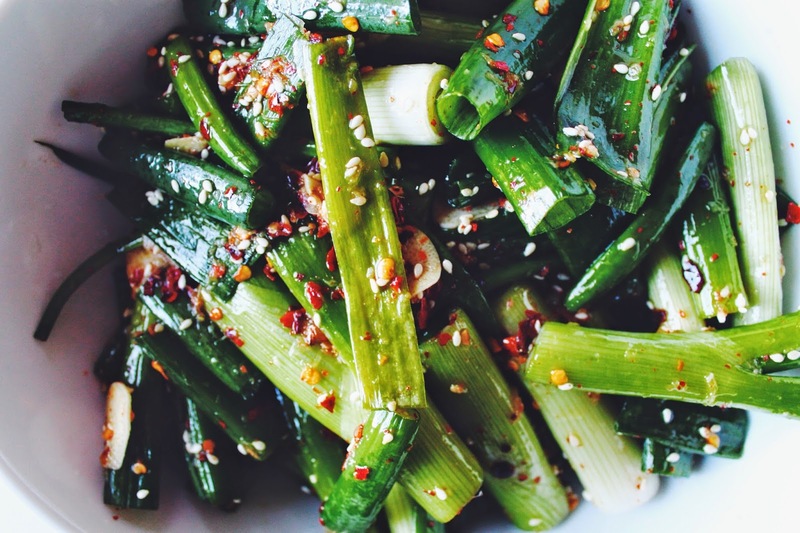 You had me at scallion. I will be making this after I go to the market on Friday. I love your story and rcently came across the beautiful feature on Saveur. I grew up watching my folks in their restaurant, working side by side and your story delighted me with some of the similarities! (Though mine had a Chinese restaurant in a small country town.) 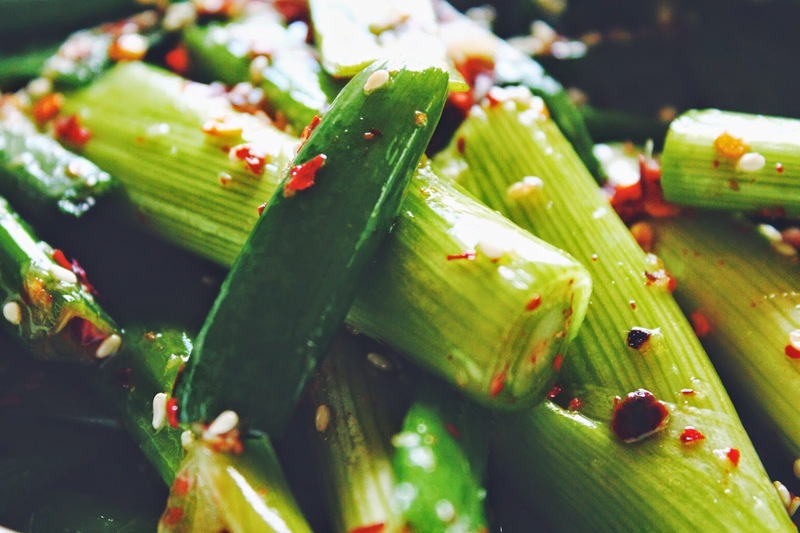 I love this wonderful solution for using scallions and I can see myself enjoying some over fresh rice and runny eggs, sometime soon! Thanks for your note Alice! I love that you were able to find a connection to my site by way of your family's past! Also, the idea of serving this on top of some runny eggs sounds like absolute heaven! So glad you found my little corner of the web! Thanks so much for stopping by!